Apparently, being really good at gaming on your Xbox 360 might prepare you for more than a lonely life in your basement yelling at 13-year-olds while wearing a headset. 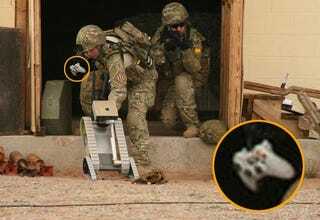 According to this photo, soldiers in Iraq are using Xbox controllers to control SUGVs (Small Unmanned Ground Vehicles) that go out on patrol and keep soldiers out of harms way. Sure, it's a little different than playing Crackdown, but it makes sense that soldiers would use controllers they're familiar with rather than having to relearn a new system. So there you have it, next time your mom tells you you're wasting your life with video games just tell her you're training to go to Iraq. That'd be totally worth it, right?